Users now have an easy way to put messages off until the weekend. Google is giving Inbox users a couple more ways to avoid dealing with their email right away. The company announced Friday that users of its alternative email client are getting two new snooze options that will move emails out of their inbox until an appointed time. People will be able to make emails reappear later in the week or at the weekend, two options the company said users had been asking for. Users can also set up Inbox with their preferred date and time on the weekend to receive those messages, which is useful for people who have different weekend schedules, or just a particular time when it makes sense for them to tackle issues that aren’t pressing during the work week. The snooze feature was popularized by Mailbox, an app Dropbox acquired in 2013 and recently shut down. That functionality has made its way to other email apps in the interim, including Inbox and Microsoft Outlook. Being able to snooze emails is helpful for people who tend to use their inbox as a to-do list, something that Google’s revamped email client encourages. 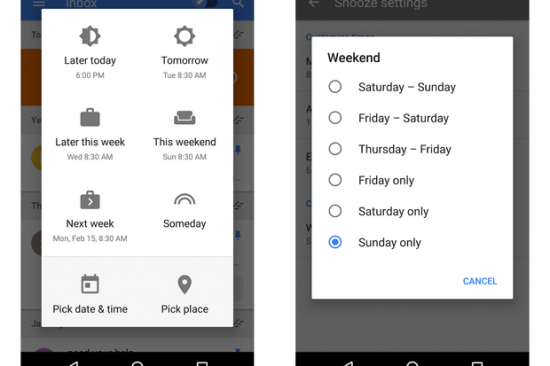 The new snoozes will be rolling out over the coming week, along with a new look for snoozing overall that Google is also introducing with this update.